This entry was posted on Monday, December 17th, 2012 at 7:37 am and is filed under couples, doodles, film, humor, love, marriage, quotes, relationships. You can follow any responses to this entry through the RSS 2.0 feed. You can leave a response, or trackback from your own site. Thanks for the comment, Ms. Jacquie. That’s the best I could do with a wad of Kleenex and some shower drain debris . . .
“a wad of Kleenex and some shower drain debris” . . . *Gaaahk-Ka-Hack! * … pardon me Mr. Hairpuppet… I just coughed up Mr. Hairball. Woha! That is sooooo funny . 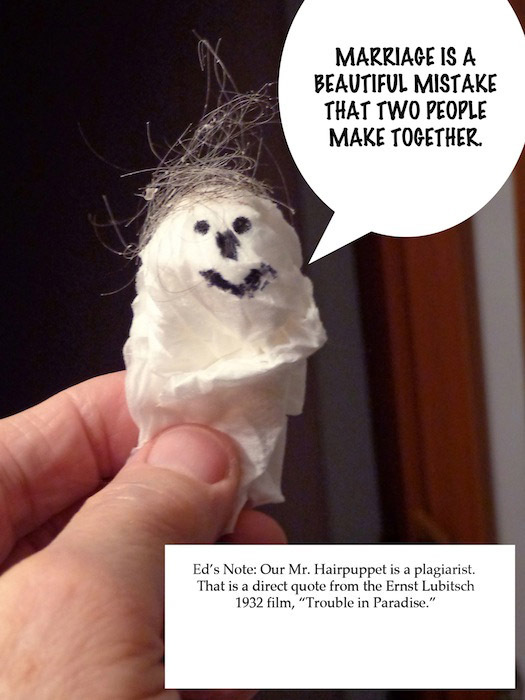 . . seems Mr. Hairpuppet is an inspiration for many of us like-minded (read weird-ish) folks. Thanks again, Jacquie. Wouldn’t a well-dressed Mr. Hairpuppet be sporting a Christmas cap and little red bow tie? Perhaps, if I can find the time to find them before next Tuesday . . .
Ms. Jo-Ann is right… even those of us who have limited means should take into account the uplifting factor the festivities of the season engender, and dress accordingly. Mr. Hairpuppet IS/COULD BE an inspiration for us ALL at this time of year. There IS, however, a problem, in that Mr. Hairpuppet has made himself as presentable as possible with the materials he was given. (Truthfully, the thought of Mr. Jim showering in a little Christmas cap, and a little red bow tie in order to give Mr. Hairpuppet a new lease on life, is mind boggling and makes me want to do the Mr. Hairball dance, yet again.) ‘Just sayin’. Well, ONE hardly knows HOW to respond . . . Goodness gracious . . .